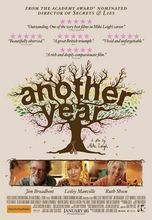 British comedic drama follows an aging couple and their relationships through one calendar year. Counselor Gerri Hepple and husband/geologist Tom, a happily-married couple living in the United Kingdom, find themselves surrounded by friends largely mired in undesirable or unhappy situations and the ever-looming specter of old age. Their interpersonal challenges are covered in Another Year, a dramatic comedy about family, love, laughs, and loss told within the time frame of one calendar year.